Families4Families provides members with information, resources and suggestions about your situation either over the phone, email or face to face. Some of the issues that Families4Families can assist you with include: information about what services and support Families4Families offer to families/carers of those living with an acquired brain injury; practical information about what services are available to families and for people living with an acquired brain injury in their community and how they can access these services; referrals and/or provision of literature about acquired brain injury and related topics from our own materials, from those of our volunteers and supporters and from organisations that have allowed our network to pass on their materials; referral to one of local support groups for those living with or caring for a person with an acquired brain injury; comprehensive presentations for professionals, the general public, community groups and interested parties on Families4Families, our services and our stories; referral to one of our phone volunteers so that you have someone to talk to about the challenge of living with ABI or living with someone with ABI or supporting someone with ABI; registration for regular email notification of our events, new information and generally what is happening within SA and beyond in the area of ABI. Our phone number is (08) 299 0015 and is manned by our volunteer team. If we are unable to take your call please leave a message and as soon as we are able we will call you for a chat. Please note that, due to resources limitations, we are not able to offer phone counselling or crisis support, and that our ability to respond to calls is limited by our volunteer staff availability. 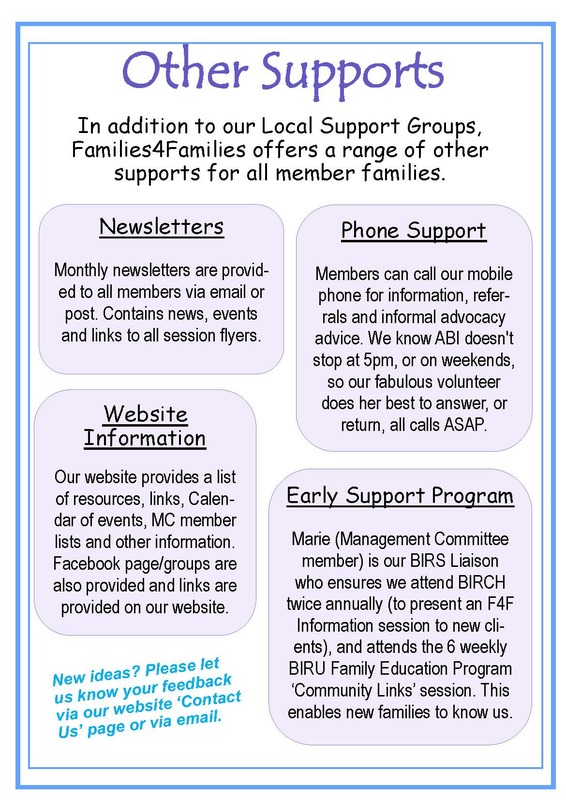 Our email is office@families4families.org.au and is checked regularly for member requests. For a face to face meeting, please call or email to make a time at our Hub (34 Dunorlan Rd, Edwardstown) or we will arrange to meet at a convenient location.